Digital cameras are such a fantastic way to preserve memories. You can take almost as many pictures as you want to, right there on the spot, and have an instant preview of what your picture looks like. You can print your pictures if you like, but you don’t have to worry about your pictures fading or being damaged beyond repair. It’s easy to make a backup of your digital pictures on computer, and you can simply print more pictures when needed. The issue that I find when using a digital camera and storing the pictures on computer is that very soon after having used a digital camera, I have thousands and thousands of pictures that I’ve saved. If I’m trying to find a certain picture, it could take a very, very long time (time that I don’t have). Why Care about Organizing Pictures? If you have a hard time finding pictures, or remembering who was in the picture, the date it was taken, etc., imagine when you’re gone and your family is going through your pictures. It’ll be a mess! They won’t know what’s what and what’s where. Save everyone a little bit of work and organize your pictures. A few simple steps can help you better organize your digital pictures. The Google Pack has free software to help you easily organize your pictures. Whether you use a visual photo organizer, there are still things that you can do to better manage hundreds if not thousands of pictures. Inside the Pictures folder, create Category Folders to help you better categorize your pictures. Pick and choose from the options below that best suit your situation. Family Events – For reunions or family gatherings. Holidays – Christmas, Easter, etc. Nature – If you like taking pictures of mountains, vistas, wildlife, etc. Extended Family – For pictures of relatives. <Your child’s Name> – Create as many folders as you need to for each child. Place pictures in each folder where the subject of the picture is your child and the picture doesn’t fit in any other category. 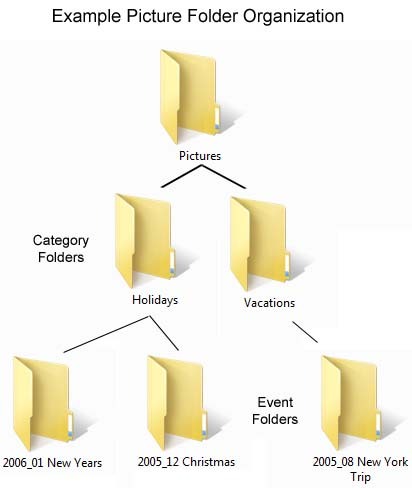 Inside your Main Folders above, you’ll want to organize your pictures just one additional step into Sub Folders that will make finding your pictures much more easy for you and for your family. Let’s say you go on a a few vacations, take some pictures on holidays, etc. Below are examples of how to organize those specific events. You may prefer to add the date at the end of the file, and that’s perfectly fine. Putting the date at the front helps to sort the picture order a little better. Since this example picture is from a vacation, it would be saved in the following folder structure Pictures > Vacations > 2007_10 California Trip. All other pictures from the “California Trip” would be added to the “2007_10 California Trip” folder. Now that you’ve got a great start, go ahead and get your digital pictures organized. Your descendants will thank you. Quick Tip: You can use the free editor Picasa found in the Google Pack to drag and drop photos to new folders and rename multiple photos all at the same time. Just highlight (or select) the photos you want to rename and press the “f2” key. Another great way to preserve and backup your digital pictures is to print them and put them in a photo album. Yep, the good old fashioned way of storing your photos won’t be going away anytime soon, and it makes it easy to view and share your pictures. If you want the modern mixed with the old fashioned, you could save your digital pictures to disc (CD or DVD) and store them in a DVD storage album for safe keeping and easy reference.